Most items purchased from our website may be exchanged or returned within 14 working days from the date of shipment. Only items that were damaged or defective can be returned. However, we will not be responsible for the damages caused by shipping. Items that are not fit are not returnable. Please email us on the sizes, color etc before purchasing the items. - Return Order Condition: The merchandise returned or exchanged must be unworn, with all original tags attached, and in its original packaging. Return items with any sign of being worn are classified as unacceptable and will not be refunded. - Shipping Charges for Return Items: Customers are responsible for the shipping charges of the returned items and they should take up the insurance on their own. - Shipping Option or Return Items: When sending a return or exchange it is recommended that you use a parcel service such EMS or DHL that offers a tracking method. If you do not use a courier that offers a way to track the package or offers a return receipt request, our company cannot be held responsible for non-receipt of return goods. - Shipping Duration for Return Items: Return items must be received within 14 days of the RA number being issued. Items received after 14 days will be classified as unacceptable and not refunded. - Credits: Credits will be issued within 14 days of receipt of item. Please include your order date and order number to expedite processing of your credit. - Buyer pay the returning shipping fee and clearance fee yourself in advance, and also you need take responsibility of shipping fee of sending to you, then we will accept returning back . - After we get the returning package and after check, we will refund to you if the returning goods all with a good condition. Free shipping in US 10 - 20 business days Romance Pink V Back And Neck Asymmetrical Wrap Dress Slit Specifications Material 100% Polyester Decoration Slit Neckline V-neck Length Ankle-length Size S, M, L, XL Color Pink Category Maxi Dress Detail Our Wholesale Pink V Back And Neck Asymmetrical Wrap Dress Slit is the latest in a romantic pink color. This maxi dress features a wrap around design creating a v neckline, stylish V back, front slit and adjustable straps. This maxi can be dressed up or down for any occasion. Try styling yours with a long sleeve top when the weather gets cold! Features: V back and neck help you showing off your sensual at front and back. Romantic pink color features spaghetti straps elevate your slimming look. Wrap around design create front slit for a more fashion look. Asymmetric hemline and maxi length give you ethereal feeling. Elevate your look with heel strappy sandal. Material: 100% Polyester. Note: There maybe 1-2 cm deviation in different sizes, locations and stretch of fabrics. 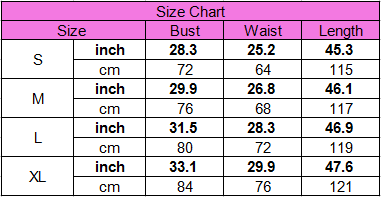 Size chart is for reference only, there may be a little difference with what you get. Color may be lighter or darker due to the different PC display. Wash it by hand in 30-degree water, hang to dry in shade, prohibit bleaching.